I’ve now been working for the Scottish Government as a ‘Glow Product Owner’ for a month. This has been an interesting experience on lots of fronts. On a practical level it means 4 hours or so commuting each day. This is not as bad as it sounds for someone who likes spending a fair bit of time looking at screens most days. 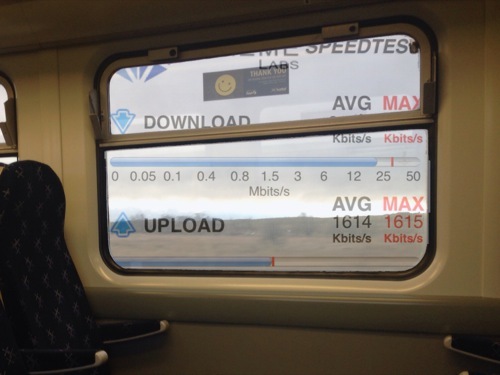 There is wifi on the main Glasgow to Edinburgh trains and they are reasonable spaces to work on. So I get to spend about half the commute getting some, work, email, blogging, podcast editing and reading done. I’ve replaced the train wifi with a 4g wireless router. Interestingly I get up to 4 times my home broadband speed at some points, others it drops to 3G and there are a few dead zones. What is a product owner anyway? The work itself is a very different role than anything I’ve done before. My expectations were pretty wide of the mark. The role of a product owner is becoming a lot clearer. Last week we (Ian Stuart and myself) shadowed Education Scotland’s Jennifer McDougall in this role working with a set of developers who are working on a prototype. This was really valuable. We could see the product owner in action, finding out how the role really works. In these sorts of meeting the role is to represent the users (learners and teachers) and make decisions on the work in progress. The product owner is one in an agile team and it is this team development process that give me confidence and hope in Glow. As developments will be taken forward there will be constant dialog between the developers and product owners. Hopefully this means than when decisions are made about, say, dropping a feature to insure that a project meets deadlines, that that decision will be made in consultation with the product owner. This then puts some pressure on the product owners to do their best to represent and balance both the vision of the ICT excellence group and all the stakeholders (picking up some jargon on the job). Another feature of the process that will give some confidence is the way the whole project is organised. I’ve not worked in such a structured environment. There are folks in the team doing jobs I’d not imagined, a lot of these are to organise the project, keep it on track, ensure testing of systems will be carried out in a systematic manner. The people in these roles do not, in the main, have education experience, but we have been constantly encouraged by the way they ask questions that expose what learning needs from glow. A fair bit of time has been spent by Ian and myself explaining as best we can: teaching and learning, the curriculum, the ICT excellence vision and, the hard bit, how the current mix of services that make up glow are joined together. This has been useful both ways, seeing the services from another perspective has shown me both how much of the basic functionality of glow groups is powerful and how complex and baffling the organisation of the elements of glow can look. The baffled look on the face of someone when they are taken through the setting up of an e-portfolio blog for the first time is a picture. We are also getting a bit of inside into the complexity of developing services that will meet the needs of learning, security and a multitude of stakeholders. My brain feels as if it expanding to the point of pain at some times. Much to the horror of my previous self this is not going to be a quick fix, most of the things that Ian and I are involved in are long term projects. Even the short term ones, for example the blog migration (close to my heart), are not going to happen overnight. Factors I has not considered swing into play. Luckily we are surrounded by folk who do understand them are at hand. Although I am not directly involved in the new MS 365 bit of glow we are using those tools for working and communication. This has increased my awareness of the new goodness that is already in glow. Just thinking about skydrive and the office web apps by themselves we have got quite a nice bundle. 25GB of storage in skydrive (not to mention 50, I believe for email) and word, PowerPoint and excel in any modern browser. These apps are fairly fully featured and easy to use. You also have the ability to have more than one person editing documents at the same time in the same sort of way as google docs. Ian would not forgive me if I did not mention OneNote, this has been a revelation. Ian and Islay High school make heave use of this in their long running one-to-one project. The desktop version is like a wiki without a browser with very powerful multi-media facilities. Given the security in the government building we cannot use the sharing built into 365 with desktop applications, but we can use the web version. This feels to me like a very simple light weight wiki without any of the complexities. Not the multi media powerhouse, Ian is used to, but a way to simple build a linked set of ‘pages’ and ‘sections’ in a multi user document. The page and sections are made automatically so you do not need to understand links and title. The sections in the web app are limited to styled text, images and links, but that would be plenty of features to get collaborative knowledge building off the ground. We have found that OneNote I’d pretty good for sharing information is a fairly messy but quick way. Coincidently Charlie Love posted a nice youtube intro to Skydrive in glow. If I was faced with thinking of how to get some quick benefits from glow with learners, this is where I would start, the office tools and as an introduction to online collaboration and collective knowledge building OneNote is a good place to start. After a month I think I am beginning to find some ground under my feet but just starting to appreciate the size of the task. Ian and I have had a lot of good wishes via twitter and other networks, we appreciate this, so thanks, we will need them.